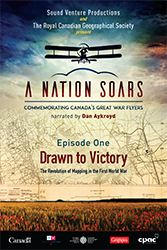 To highlight Canada’s first aviation heroes, Sound Venture, Canadian Geographic, The Royal Canadian Geographical Society, CPAC and Canadian Heritage, have partnered together to create an hour-long documentary, a Western Front giant map and additional bonus features. If it wasn’t for attaching cameras to First World War biplanes the Allies may have not won the war, Canada and the world would have taken much longer to map, and Google Earth might not exist. Drawn To Victory, narrated in English by actor Dan Aykroyd and in French by explorer Bernard Voyer, surprisingly reveals that the greatest tactical weapon of the First World War was not a “weapon” in the traditional sense. Rather it was made of paper…accurate and reliable maps! No war in history, prior to this one, relied so much on maps. The documentary explores how the Allies, through the new science of aerial photography and new mapping techniques, grew from one British officer and one clerk armed with 1880s antiquated maps operating out of Maps General Headquarters in France, at the start of the war, to almost 5,000 Allies who produced more than 32 million maps by the war’s end. Drawn To Victory focuses on Canada’s role in the evolution of aerial mapmaking. It also highlights that a key element in Canada’s victory at The Battle of Vimy Ridge, and subsequent Canadian battles, was that even the lowest ranking Canadian soldier was made familiar with details of upcoming attacks through the use of intricate barrage maps, trench maps and mockups. The incredible impact of the new mapping standards and techniques developed by the Allies in the First World War, coupled with Canadian innovation in aerial photography and map mosaics directly after the war, enabled the newly created Royal Canadian Air Force to map Canada’s uncharted territories in less than 60-years. The documentary also brings to the forefront that even in today’s era of GPS technology, paper mapmaking and map reading are still essential skills required by Canadian soldiers just as they were in the War to end all Wars. One giant (8 metres X 11 metres) and four classroom sized (5m x 4m) travelling floor maps featuring the Western Front, with accompanying teacher resources, for borrowing free-of-charge by members of Canadian Geographic Education. Teachers can also visit Canadian Geographic Education for free online resources, including lesson plans, a map of the Vimy Ridge battlefield and a tiled poster map, in French or English, with an overview and timeline of the evolution of cartography before, during and after the First World War.